SVB on Wine: Can Wineries Increase their Bottle Prices? Can Wineries Increase their Bottle Prices? That is a question all wineries are asking: When will they be able to meaningfully raise bottle prices and recover their margins? To get at the answer, you have to start by answering the question, what drove the prior pricing increase in the 90's into the 2000's? The answer is the middle-class and the Boomers. The Great Recession wasn’t that great for anyone but it outright sucked if you were in the middle class. The middle class is that section of the population that was more likely to have lower savings, lower stock market exposure, and a higher percentage of their net worth centered in their homes. Since 2000, the middle class has shrunk in size, wealth, income and optimism about their future according to a recent report from The Pew Research Center. The impact of the weakening of the middle class will continue to linger and impair the wine industry's ability to pass on the higher costs of grapes for many years to come. The Middle-Class in the US has been the world’s most voracious consumer and the largest user of consumer debt for decades. We've essentially consumed our way to prosperity and then sold debt to the World to finance our consumption.... which is a trick to explain. Most of that consumption has been from the middle class and since the early 1990's when Boomers came into their own and drove wine consumption and bottle price increases, the middle-class has also seen their wealth increase.... at least until 2007 when wealth crashed back to 1983 levels as you can see in the title slide. How did we see that kind of growth in consumer debt and wealth? Consumer debt became easier to get starting in the 1960’s when Bank of America started sending out their BankAmericard. That later became Visa in what was the largest IPO in the history of the US at the time. Consumer borrowing was encouraged by the US Government when they made consumer interest tax deductible in an effort to spur consumption. The Regan Tax Reform Act in 1986 disallowed the deduction for consumer interest but made interest in a home equity loan deductible instead, thus starting a mass run on home equity lines of credit. People paid off their credit card debt in favor of equity lines. Banks started packaging that debt and selling it off in blocks and securitization took off in the 1990's, transferring risk off bank balance sheets and allowing underwriters on Wall Street to make a ton of scratch just processing the debt issuance, taking a fee and transferring the risk. At that point consumers went back to the well and started using credit card debt, running that up and then refinancing that into higher value homes beginning a consumer spending cycle that went on for decades. By the time of the market collapse, the middle-class consumer was far more likely to have their wealth concentrated in real estate equity, and carried higher debt levels percentage wise then the other wealthier and poorer cohorts. They were killed in the market collapse compared to wealthier cohorts who had a more balanced wealth structure, and even compared to the poorer cohort who had no real estate wealth to lose. But it is that demographic that was the fuel that sparked the heavy and consistent growth in wine consumption since the early 1990's. Today, that same demographic cant refinance their consumer credit cards and aren't likely to spend ahead of their earnings as a consequence. That brings us to today. Take a look at the chart to the right. You can click on it to get a larger view. Notice the dip in consumer debt at the crash. 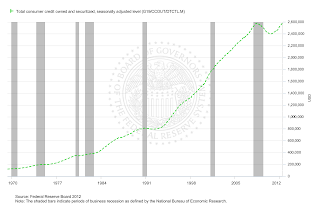 Also notice the change in consumer credit growth rates starting in about 1993? Compare that to the growth in the Total Wine Consumption chart below and you will see the graphs are eerily similar after the 1990's. What we've seen in the past 20 years is consumerism with an unsatisfied appetite. But what we are going to experience in the next 10 years, is Boomers who have the wealth and drove consumption prior, slowing in their profligate spending simply because they are ending their prime consumption years. The Gen X crowd are those that are the most obvious consumers and should be the targets for wineries today, but it is a smaller cohort. Millennials will play the hoped for role but that is a decade away For now, we really need to see the middle class continue to heal, and I believe that is likely. Why? Because the destruction of middle class wealth and income has been so severe, it can only improve. There is a long way to go still in a middle-class recovery. Those wineries expecting rapid price increases like we've seen the last 20 years will be disappointed. Modest increases are available because supply is trending to shortage but even then, foreign substitutes hold that up. The only real hope for price increase is if inflation is allowed to run up, and in my opinion - that would be the smartest thing the Fed could do as it would deflate the National Debt. But that's a long discussion for another day. What are your thoughts about the middle class in America? How will that demographic impact wine consumption and pricing in the next decade? Without a strong middle class, I believe that it will be very difficult to sustain the explosive growth in the number of American wineries that we have seen over the past dozen years. During the middle to last quarter of the past decade the buying, selling, and refurbishing of new purchased homes accounted for 20% of the US GNP. That engine is still stalled (for the most part). The rest of the countries around the world are looking to us for rescue, many of them are deeply hurting...just yesterday, I saw a report that stated there is a 50% increase in merchandise inventory build-up in China over the past 12 months. The use of consumer credit has been played out. Right now, I cannot see a mechanism that will allow for a significant rebirth of a vibrant middle class. If it is to happen the renewal of a stronger American middle class will simply take a long time. It is amazing that the US has continued to increase its consumption of wine during the Great Recession..I think it is a testament of how much the drinking of wine has become a more important role in our society. Any increase in American wine prices must be changed gradually and slowly. The impact needs to be minimal. American wineries need to pay close attention to the percentage split in the volume of American wine versus imported wine consumed. In Europe, the wineries are hurting far worse than here. The huge increases in acreage in South America has to be paid for...increased prices for American wine could push that hurting middle class into the waiting arms of foreign producers. Thanks for the comments Mark. I think the wine industry has an advantage over mass-luxury goods because its more affordable and lets face it, people feel good with a glass of vino. In countless reports, wine is described more of a need instead of a want. So consumption can increase .... but price? Everything that I see suggests some modest increases are available, but its a long and slow decade we have ahead of us unless inflation takes off. Is there a chance that wine was too expensive at the height of the housing boom (aka wine boom)? Naturally wineries need to keep an eye expenses and margins, but I really think the key is wineries being more involved in direct access to their fans and to directly create more fans. Some type of distribution system will always be necessary, but there needs to be more direct to consumer relationships and transactions. This will be far better for wineries than increasing their bottle prices. Such a strategy will off-set the "waiting arms" of the foreign producers as they can't go direct for the foreseeable future... though I can dream of that senario can't I? Its certainly the strategy small producers at the high end, and e-tailers are embracing. Its a good one too. But I doubt it will stop foreign wines from gaining a stronger foothold. The World is smaller than it was in the 1970's and even then a lot of imports (Blue Nun, Lancers, Mateus, etc) were excepted by the consumer .... just as the Japanese cars were accepted over the American producer at the time. American consumers aren't particularly loyal to their own country's products if there is a good product that is competitive on price in the same category. I'm headed to Mendoza Argentina for a speech the middle of next month. I've never been there and am looking forward to seeing their business and philosophy. That will for certain be the content in this blog next month. I am looking forward to your thoughts on Mendoza. We were there 2 years ago and were amazed an the experimentation going on. I am convinced their wines will keep improving while staying at the same price point. Labor is cheap in Argentina. When they say handcrafted, it is true. Cheaper to use labor than machine. Understanding the threats is one of the keys in developing strategy and defining opportunity. I'm looking forward to it as well and hope to find some interesting business points to pass on. The "feel good" factor you speak of Rob is the key for wineries wanting to increase prices. A winery delivering higher perceived benefit (feel good)driven by quality improvements should be able to charge a higher price. They simply shift out along the indifference curve, or, even better, assume a strategic position below the existing curve. Naturally, successful execution of such a strategy may be a little more challenging! Thanks Anonynomous. Please join the community in the above right column when you get a chance. Agreed with your comment. We aren't selling just wine. All luxury goods sell something besides what's in the package. You have to look at world wide production (and yes Mendoza is a good place to start) and see that there is too much wine chasing too few customers. And it only needs a few people to start trading down for them to discover the ocean of perfectly acceptable wine and below cost prices. Until supply comes into line with demand there will be no opportunity for the average winery to increase its prices, and in the short term they will need to maintain cash flow by selling below cost. Not a pretty picture. Colin - World supply is part of the story and that is at the lowest point of excess in my memory. The other part that plays a role is exchange rates. We are strong right now versus the Euro favoring their exports to the US. Argentina is a little different animal. The ARS continues to decline vs the USD and that favors their imports too, but their government has been through catastrophic swings in their government and economy ... leaving inflation uncontrolled at 25% presently makes them want use foreign currencies for trade instead of their own, not collecting taxes, nationalizing private pensions, nationalizing the railway system (1950's), recently they nationalized an oil company owned in partnership with Spain .... who wants to do business there if your investment is taken, or currency devalues consistently? All that said ... they make great wine and if the country holds together at .21 pesos to the dollar, they will surely have a pricing advantage here. I'm looking forward to learning more about the business world there next month and hope to have some positive things to add to the story. I remember the go go 90's. What I couldn't figure out was why "everyone" was spending more than they made. Consumers not only charged their credit cards to the max, they also borrowed against their equity of their home as though it was free money. People overspent and under saved. Families are supposed to have their mortgages paid off when they retire, not have a house that is 90% leveraged. Until the debt crisis is completely unwound, we won't have a true recovery. Given that many households are still underwater mortgage wise, I expect that we could be looking at another 5 years of what we have had for the last 3-4 years. It took WW II to bring the US out the depression. We had an economic hit that was almost as bad. None of the politicians will talk about it but it usually takes a long time to work out of a debt crisis. What we had wasn't the typical recession that we could quickly grow out of like we did in past years. So until this is fully resolved - prices are likely to be stuck right where they are. Thanks for weighing in. I agree with the majority of your perspective. For a little shading, the debt crisis really doesn't have to be unwound for recoverym, simply because people spend what they have. Its hard to imagine because it makes no theoretical financial sense, but many people are OK with living in their homes underwater. You'd think they would think they are never going to be in the black again so might as well walk away ... especially when the Government provides a tax break on the debt forgiveness (that expires in December I believe). Many consumers think different about the home as an asset. They think of it like rent instead now. They pay the mortgage and in many cases with modifications, could be less than rent. Moving is a pain so they stay and besides, they would need a down payment again. We will see years of forclosures ahead of us because at some point, those people have to move and can't, so they let the home go and the investor takes the loss. But we can still recover as those people will devote the same amount to rent/mortgage either way. What they wont do is see equity increases and spend ahead as they did in the 1990's .... to your point. 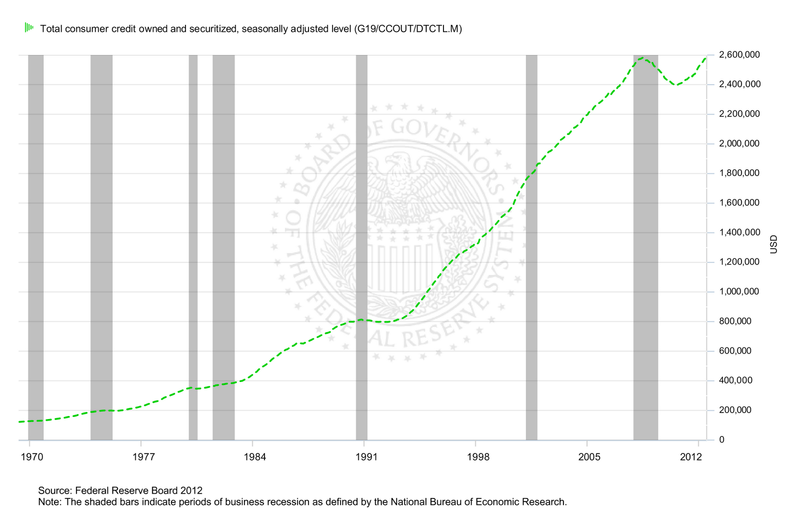 And yes ... recovery takes a very long time when its a debt bubble. I'd expect a decade of lingering pain. Is it Politically Correct to make a Profit?